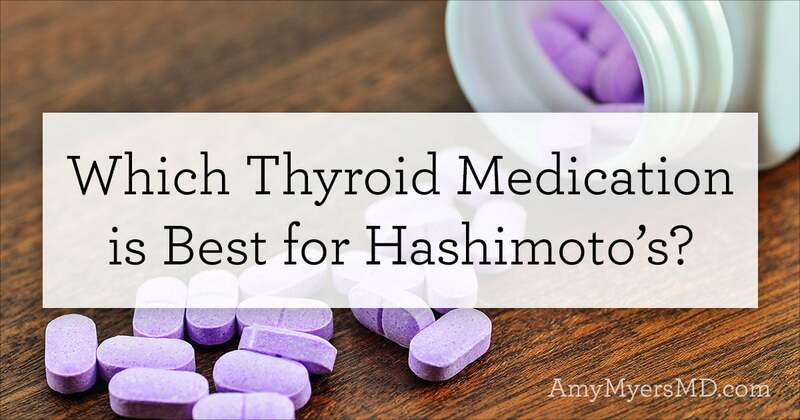 Which type of thyroid medication is best for Hashimoto’s? This is something I am asked all the time by my patients, in my support community, and in my Facebook community. Before I address the question however, I first want to clarify that thyroid medications are not in the same family as the harsh drugs and immunosuppressants used to treat other autoimmune conditions. It’s simply a supplemental dose or replacement for a hormone that is necessary for you to live. 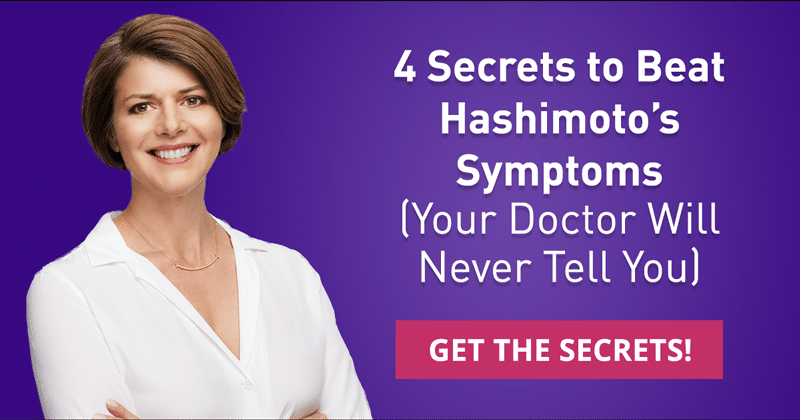 If your thyroid has been too damaged from Hashimoto’s, then you may need supplemental thyroid hormone for the rest of your life (because my thyroid was ablated I certainly do!). However this does not mean you have failed or that your condition cannot be reversed! 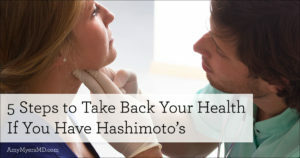 Reversing Hashimoto’s means that your immune system is no longer attacking your thyroid, your antibodies have disappeared, and you are symptom-free. Ok, now onto the million dollar question! The truth is there is no ‘one size fits all’ when it comes to thyroid medications and I don’t believe that there is one right choice for everyone. What I have learned over the last fifteen years as both a thyroid patient as well as a thyroid-prescribing physician is that when it comes to thyroid medication it can be just as much an art as it is a science. You, the patient, need to listen to your body and share your experience with your doctor. And we, physicians, need to listen to our patients as well as look at their labs. I have found over the years that how the patient is feeling can often tell more than what the labs say. Most doctors only check your Thyroid Stimulating Hormone (TSH) levels. If you are lucky, they will test your Free T4 levels to see if you are low on the storage form of thyroid hormones. But, what those two tests will not tell you, is if you have difficulty converting T4 (the storage form of your thyroid hormones) to T3 (the active form), if you’re converting too much T4 to Reverse T3 (the hormone that “puts the brakes” on your metabolic processes), or if you have autoimmune thyroid disease. In short, TSH and T4 tests only tell you a small part of the story, and if your treatment is based on only those two numbers, there is a good chance that your lab results will return to “normal” but your symptoms will not go away. To get a complete picture of a patient’s thyroid health and medication needs, I order all of the thyroid tests listed below. I have also included the ranges for each marker that I’ve found to be optimal for both my patients and myself, and I cover this in detail in The Thyroid Connection. Now that you’re armed with the insights from your lab results, you’re ready to look at all of your thyroid medication options to find the solution that best matches your needs. Let’s take a look at the four main types of thyroid medications. The most common Hashimoto’s treatment is synthetic T4 hormone medication, usually prescribed as the drug Synthroid® or Levoxyl®. In fact, Synthroid® is the most commonly prescribed drug in America, with 21.6 million prescriptions a month. Synthroid® and Levoxyl® provide a steady dose of T4 (the storage form of thyroid hormones) for your body to convert into T3 (the active form), and come in a wide range of doses, making them very convenient. The downside of T4 medications of course is that, unlike your real thyroid, they don’t provide any T3. As we’ve discussed previously, many patients have difficulty converting T4 to T3, because of adrenal fatigue or nutritional deficiencies, meaning no matter how much T4 they take, their T3 levels will remain low and they’ll continue to experience symptoms. This is why it is so important for doctors to check not just TSH and T4 levels, but also T3. A patient’s lab results can look “fine”, yet they’ll still be low in the hormones that actually power all of their metabolic processes. 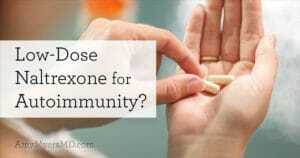 Another downside of synthetic medications is the inactive ingredients used. Thyroid hormones are prescribed in micrograms, so the amount of T4 in each pill is incredibly small. The rest of the pill is composed of inactive ingredients, synthetic colors, and fillers that vary by brand. Synthroid®, for example, contains lactose and cornstarch. Tirosint is a T4 medication that includes only three inactive ingredients (gelatin, glycerin, and water) and is produced in a dedicated facility to eliminate the risk of cross-exposure, making it a good alternative for those who are sensitive to foods and fillers. There are also generic versions of Synthroid®, labeled levothyroxine. Their fillers vary by manufacturer and can sometimes contain allergens. Since pharmacies can change manufacturers of generic medications without warning, the inactive ingredients in your generic medications might vary month to month. What’s more, studies looking at levothyroxine have shown that their T4 doses are inconsistent across manufacturers and pharmacies. In a number of patients, I have seen an improvement in lab results and a decrease in symptoms, just by changing from generic T4 to a brand name T4 medication. For this reason, I never recommend that anyone take generic T4 medications. If you are a person who is not converting T4 into T3 very well, then T3 can be prescribed to supplement your T4 medication. There are several types of T3 medication, including preformed, synthetic T3 (frequently prescribed as Cytomel®), and compounded T3 medications, which are custom-prepared at the exact strength and dose requirements of the patient, as specified by their doctor. As we covered in Part I of the series, T3 doesn’t remain active in your body for very long. Preformed T3 medications, such as Cytomel®, are only effective for about 10 hours, and must be taken twice a day. Since they provide a sudden burst and then decline in active thyroid hormones, I’ve found that many patients feel jittery shortly after taking them, as if they took a shot of espresso, and can feel sluggish or tired as the effectiveness wear away. Compounded T3 medication can be prepared in a time-release formula to avoid the hormone rollercoaster patients often experience on Cytomel® and similar preformed drugs. The downside of compounded medications is that some insurance companies won’t cover them, and compound pharmacies are not as common as regular pharmacies, so it might be difficult to find one near you. Fortunately, compounded medications are far less expensive than standard medications, so they are typically still affordable even without insurance, and most compounding pharmacies can ship your medications to you. There are also a few different thyroid medication options that include both T4 and T3, namely desiccated thyroid medication (which comes from the dried thyroid glands of pigs) and compounded T4 and T3 medication. Desiccated thyroid medications, such as Amour®, WP Thyroid®, and Nature-Throid®, provide the full range of thyroid hormones, including T4, T3, T2, and T1. This is particularly beneficial for those patients who have difficulty converting T4 to T3, and may be helpful for hypothyroid patients trying to lose weight, as some scientists believe that T2 is important for weight loss. Desiccated thyroid medication also includes thyroglobulin (the binding protein that carries thyroid hormones through your bloodstream), which slows the distribution of T3 throughout the body so that a single dose lasts the whole day. 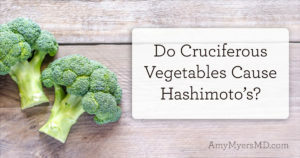 In theory, the thyroglobulin could cause problems for those with Hashimoto’s as it could elevate your thyroglobulin antibodies. I say ‘in theory’ because I was taught this in my functional medicine training, however, I have prescribed thyroid medication to over a thousand patients, I have only actually seen this happen in four patients. So, while it is possible, clinically I would say it is very rare. Because desiccated thyroid medication is the most complete treatment option, and the most similar to your body’s natural thyroid process, I find that it is the right fit for many (although not all) of my patients. Beyond my own clinical experience, multiple studies have shown that some patients prefer desiccated medication to T4-only treatment. In a double-blind study where patients were given either desiccated thyroid medication or generic synthetic T4 for 12 weeks and then switched to the other drug, 49% of the patients preferred desiccated thyroid extract, 19% preferred synthetic T4, and 23% had no preference. The patients also lost an average of 2.84 pounds while on desiccated thyroid hormone compared to the synthetic T4 drugs. Another study found that 78% of patients who switched from a synthetic T4 treatment to a desiccated medication preferred the desiccated medication. Like synthetic medications, desiccated thyroid medications also contain inactive ingredients that vary by brand. Armour® and Nature-Throid® each contain five or more inactive ingredients, including cellulose, and Armour® contains cornstarch. WP Thyroid®, which is the hypoallergenic version of Nature-Throid®, contains only two inactive ingredients, inulin and medium-chain triglycerides. Each brand also differs in the variety of strengths it offers. WP Thyroid® and Armour® are available in eight different strengths (WP Thyroid® has more options for smaller doses, while Armour® has more options for higher doses), whereas Nature-Throid is available at 13 different strengths, ranging from low to high concentrations. Many conventional doctors are reluctant to prescribe desiccated thyroid medication, claiming that the levels of thyroid hormones in them are inconsistent and unregulated. Although this was true decades ago, since the 1980’s the exact amount of each thyroid hormone in desiccated thyroid medications is regulated using the same standards as synthetic medications. But, it is important to note that, while consistent and regulated, the T4 toT3 ratio in desiccated medications is lower than your natural T4 to T3 ratio (4.22:1 compared to 11:1), since pigs produce their thyroid hormones at different ratios than humans do. Because of this, some patients taking desiccated thyroid medication who want to increase their T4 dose without increasing their T3 will need to supplement with a T4 medication. Personally, this is what I have to do. For those who need extremely specific doses, compounded combination T4 and T3 medications offer the most flexibility, since they are custom-formulated based on the patient to provide the exact strength and T4 to T3 ratio that they need. The drawbacks of compounded medications are that they do not contain the other components of the thyroid like the desiccated porcine gland does, such as T2, T1, and thyroglobulin. As you can see, there are many different options for thyroid medication, each with their own advantages and disadvantages. Many in the healthcare world like to frame it as a black and white issue, with conventional doctors who prescribe Synthroid® on one side, and alternative practitioners who prescribe desiccated medication on the other. In my experience, it’s not that clear cut, and what works for one person doesn’t necessarily work for another. Finding the right treatment protocol can often be a case of trial and error, as you learn what medication or combination of medications, and at what doses, work best for you. As you go through this process, it’s important to work closely with your doctor and check your levels regularly, but it’s also important to listen to your body. Even if your thyroid levels are within “normal” range, if you’re still experiencing symptoms you might not have found the perfect balance yet, and you should speak with your doctor about continuing to fine-tune your protocol. Finding the right thyroid medication that works for you is very important and will certainly go a long way in helping you feel better, but remember that managing your thyroid levels through medication is only part of the process. The real work comes in identifying the underlying factors that caused your thyroid disease and making healthy lifestyle changes to remove them. 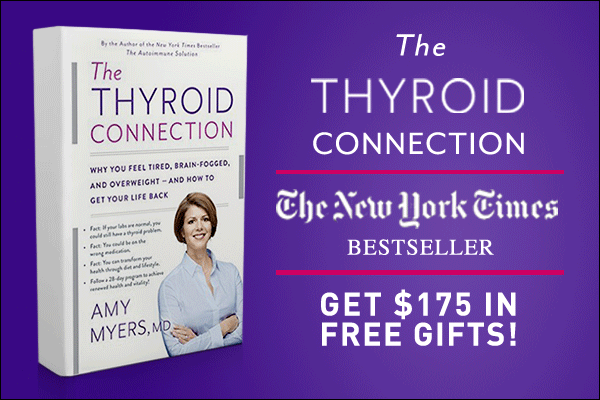 If you’re ready to tackle the underlying health issues that triggered your thyroid disease, you can read my book, The Thyroid Connection. Remember that achieving optimal health is a journey, and each person’s path is unique. This is particularly true for Hashimoto’s, which can involve many different interconnected factors. Whether you’re just starting out or you’re well on your way, know that there are resources and support available, and with enough knowledge and commitment, you can find the solution that works for you.